For many victims of sexual and gender-based violence in South Sudan, finding justice can be an uphill task, or a dark abyss, as many of the cases are never reported. “The key challenge in investigating and prosecuting cases of sexual and gender-based violence is low reporting of such cases,” says Philip Mayot Mariang, South Sudan’s Director of Public Prosecution, castigating cultural practices that impede such reporting. “You only hear a high number of [cases of] sexual and gender-based violence in reports that are rendered by human rights agencies, especially Human Rights Watch and the Human Rights Division of UNMISS [United Nations Mission in South Sudan], but when you go to the official records of the police, the public attorney, and the judiciary, you don’t get these cases,” he says. “So, you ask yourself, what happened? What happened is that the cases were not reported,” he says, providing an answer that resonated across the room where a week-long training is taking place, supported by the United Nations Development Programme (UNDP) and UNMISS. 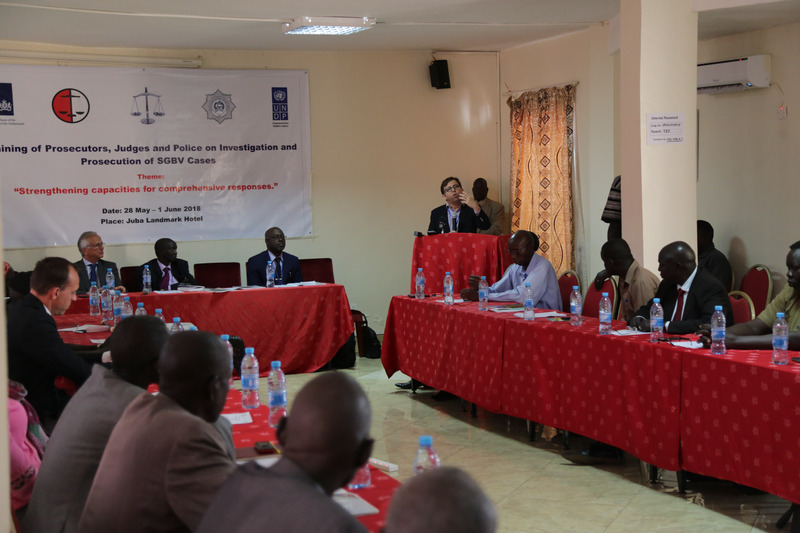 For five days, a select number of crime investigators and prosecutors will interact with resource persons from UNMISS’s substantive sections, namely Rule of Law, Human Rights, UN Police (UNPOL) and Gender Affairs, learning about the best practices in effectively investigating and prosecuting crimes, especially sexual and gender-based violence. They will in turn impart the skills acquired during the training to other national officials, thus improving capability nationwide. “This requires a lot of education of the communities. We’re dealing with traditional practices which are harmful – like early marriage and forced marriage – these are issues we need to educate the communities about, so that they refrain from them, and allow the rule of law deal with them,” he says. The Police Commissioner has more ideas. Asked how widespread the issue of early- and forced-marriage is, there is an expression of honest helplessness. “Actually, they’re not reported to us, because this happens at the community level. But they’re there, in all communities” he says. “It’s only those that happen in town – where, if parents are not satisfied, then they come to the police. But if they can settle it locally, they don’t bring the case to us,” he says. So, have they given up on pursuing justice for the victims, or trying to change these practices? Far from it, the Assistant Inspector-General says. The United Nations – through UNMISS and UNDP – is playing its role, with this five-day workshop. “This training is very critical,” says UNDP’s Chief Technical Advisor, Rowland Cole, citing the various aspects of the UN Security Council Resolution 1325, with emphasis on the rule of law, and responses in the detection, prevention, and prosecution of cases of sexual and gender-based violence. UNMISS is particularly keen to be a part of this training, as it is at the core of its work. “It’s very important to have this training at this particular moment because we have concluded – and the government has agreed – that the training exists, the capacity exists, but what’s required in to connect the dots and establish a unit to prosecute sexual and gender-based violence,” he says. “This training is collecting judges, prosecutors, investigators, who are all part of the justice chain, and who have to work together for justice to be realized. None of them individually can be trained to realize that objective,” he adds. At the very beginning of the training, there was consensus across the room that there is an urgent need to carry out civic education in order to challenge outdated cultural practices that are still obstructing access to justice for many victims and survivors of sexual and gender-based violence in South Sudan.